Whenever a guest or visitor comes to check-in or to inquire about the facilities/services available in your hotel, he/she gets the first contact at the reception desk. Thus, a receptionist always stands the best chance of availing his salesmanship. An appropriate dealing with guest explaining the detail about your hotel, you can play a vital role in salesmanship. Now, to sell your services you have to have detail knowledge of your hotel. The front office can always play an important role in overall sales of hotel facilities, although the main job of the reception is to sell the rooms. While selling rooms the front office personnel can try to sell rooms with gentle approach by saying some good traits of the room, for instance: pool view room, away from the noisy elevator foyer, with a pleasant decor or if there is any special floor with special facility or services or if there is any late check out facilities or any other facilities. Thus, a receptionist can make a sale of maximum tariff. After assigning the room the front desk agent can tell the guest about sauna, message or health club-as the case is most likely that the guest has arrived after a long journey. If it is the guest’s first visit, he/she should be informed of all other services. Following are the points for the front office staff to intimate the guest as and when required. Room location, outside view, size, type, rate, facilities in the room, ex-mini bar, hot and cold water, channel music, direct overseas dialing, TV with satellite connected channels, temperature control and so on. Number of outlets, location, types of cuisine, entertainments, timing, buffet/a’la carte, banquet, conference. Travel agency, Airline office, Bank, Postal service, Health club, Tennis, Squash, Swimming pool, Barter shop, Beauty salon & shop, Pastry shop, shoe shine, Medical center, kiosk and shopping arcade. Telephone local/ISD, baby sitter, baby cot, laundry, reservation for other hotel, business center service, secretarial service, handicap and so forth. City tour guide, city map, prayer timing, shopping center of the city, historical places of interest, commercial area, Airline/Railway/ Bus service timing and standard hospitals. Your successful salesmanship depends on your helping attitude and on your communication ability. If you can speak to guest fluently and courteously and if you can make an effective approach with a simile-you will succeed in your salesmanship. Its often very challenging to handle walk in guests. Check out this article. For more tips see our English for Hotel & Restaurant Tutorials. Also check this article on Polite Expressions that are most often used in Hotel & restaurant for more magic ways to deal with guests. 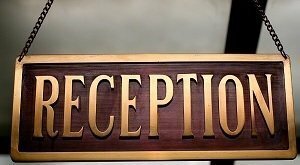 Always remember a Receptionist is……..
A guest in a hotel always tries to contact the front desk personnel for any problem or any necessity because the guest thinks that the front desk is the right place for any help or to record any complain. Sometimes guest approaches for undue privilege too. However, as soon as the front desk agent is intimated about any problem or necessity, the reservation agent will have to do the needful in the shortest possible time. In this case if it’s the front office matter-the front office do the needful at once, but in case the problem concerns engineering or the house keeping the front desk personnel will take the initiative immediately to co-ordinate with the concerned departments to get the service done. Sometime, only in-house co-ordination is not enough to meet the requirement of guest service, guest may be needed some personalized service, which is to be provided from outside organizations, for instance: the guest reservation officer may be needed to co-ordinate with Airline office, Travel agency, Tourist organization, Rent-a-car, Railway, Post office, Courier service, Tourist guide etc. to provide the necessary service. In case of any guest request or any kind of privilege the guest is seeking is not possible or available-here the front desk agent has to be very diplomatic to make the guest understand most politely that the situation prevailing in the hotel do not permit us to meet our requirement and thus, say, “sorry” or “apologize” to the guest. We must maintain quality guest service but in accordance with the house rule and with the law of the land, that is what we have to keep in mind. For all indicated in the preceding paragraph the reception desk always remains in guest’s mind as a reference point for help. Sometime guest may ask for anything to any staff of the hotel and if the staff is not the person to do that-he/she can simply refer to the front desk for the service asked for. So, for all the service reception is always a reference point. Receptionist: Good Morning, Sir. How may I help you? Guest (walk in): Do you have any vacant room? Receptionist: Yes, Sir Double or Single? Guest: I need one double. Receptionist: Let me check-if I can….I am sorry, sir. There is no double room vacant at the moment either on the 1st floor or in 2nd floor. But I wonder if you could wait till the check out time is over…. I may have vacancies then. Could I book one of the rooms for you in advance, sir? Guest: Oh! Yes, I don’t mind waiting for an hour or so. What is your check out time? Receptionist: It’s 12.00 noon, and it is already quarter past eleven. So you will have to wait for less than an hour, sir. Guest: How come? My watch shows ten minutes to eleven! That means there is more than an hour to go. I am not going to wait……..
Receptionist: I am afraid…..your watch is little slow. My watch makes 11.20 now. I set the time only a few minutes before you came. Guest: Oh! There is something wrong with my watch. You are right, I will wait for sometime. Receptionist: Thank you sir, would you take a seat on the sofa over there? Guest: OK, but I don’t know anything about the facilities you provide here. Receptionist: Don’t worry about that, sir. Here is a brochure giving all information about the hotel. Receptionist: You are welcome, sir. 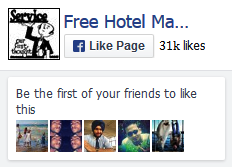 You have to know everything about your hotel, being front office. You have to know the surrounding locations…like family attractions, malls, rental car agencies. When getting hired as a front office not only you have to know the hotel but you have to know information outside the hotel. I hope this explains what you were wanting to hear. I will like to know more about front office because am into it and i needed to know more about it. So would you please tell me more or better still send it to my mail box please.